The first item I restored on the Straight 8 is the power supply. I removed it from the computer to allow disassembly, testing, and cleaning. The first step I do is a visual inspection to see if any obvious problems exist and to plan what needs to be done. I also take pictures of everything and notes as needed so I can put it back together when I'm done. The visual inspection only showed some corrosion, dirt, and foreign objects. I found 3 screws from the missing bracket that held the top of the backplanes, 1 bolt with nut attached, a piece of the broken cover, a nail, and some of the white washers that the backplanes pivot on. I then removed all the capacitors that weren't soldered in. The dielectric in electrolytic capacitors deteriorates when stored. If full voltage is applied without current limit (such as would happen if you just turned on the computer) they can be damaged. The dielectric can be normally be reformed by proper control of the current as they are brought up to their rated voltage. There are many different opinions on the Internet on how this should be done. 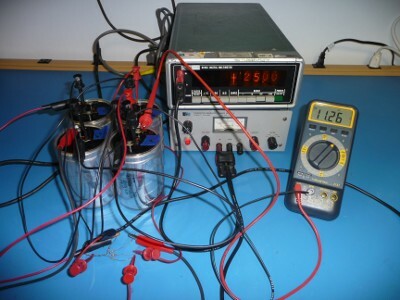 Use your favorite search engine to search for capacitor reforming for more information. For the capacitors I used bench power supplies that you can set the output voltage and current limit. I set the current limit to around 20 mA. In working on this writeup I found this manufacturers page that said the reforming current limit should be no larger than the capacitor's maximum leakage current specification. This one said to apply rated voltage through a 1k resistor to reform. My current limit was between these. The capacitors were connected through 4k resistors to the power supply so I could monitor how each was reforming and to make the reforming current balance better between them. The supply was set to the capacitor rated voltage. Make sure you won't exceed the power rating of the resistor. In the past the capacitors I had reformed dropped the leakage current to less than a mA reasonably quickly. These took much longer for the leakage to drop. After most of the capacitors' leakage was below a mA I lowered the series resistor on the leaky capacitors to below 1k to see if that would improve their reforming. It didn't. In the end the capacitor leakage varied from almost none for the best to 500uA, 1.4 mA, 3 mA, 3.3 mA, and 3.4 mA for the worst ones after a long time reforming. I don't have data on the leakage current specification of the particular capacitors I was reforming. Current production capacitors of similar value are specified as 4 to 6 mA maximum leakage current after 5 minutes. The typical leakage after 1 hour is 20% of the 5 minute leakage. The leaky capacitors were 6-8 mA after 5 minutes and 1.4-3.4 mA after hours at rated voltage. I was thinking the capacitors were usable until I could find some that electrically and visually matched but I ended up leaving them at rated voltage for two days then noticed that the vents were starting to bulge. I was able to find some reasonable replacements for all the capacitors with leakage above 1 mA. While I had the original capacitors out I cleaned them and used a wire brush in a Dremel to clean the corrosion off the terminals. On my PDP-8/I I had problems with poor connections on the .25" quick disconnect (Faston) connections. They had corroded some so the resistance was enough to cause excessive voltage drop under load. For this restoration I cleaned them all and made sure they fit snugly. I loaded the supply as shown in the table below. For connections the power supply current ran through I used a volt meter to look for voltage drops which are larger than others. On the filter capacitor bank for connections that weren't carrying the supply output current I used an oscilloscope to look at the ripple voltage. I didn't find any really bad connections. On one of the capacitors the ripple level at the rivet holding the terminal on was less than at the terminal. The terminal was slightly loose and rotating it improved the connection. I also found at one of the quick disconnect wires the ripple was larger and and varied when the wire was wiggled. For inhibit the first numbers are after turn on with machine cold, the second is after running for a while, and the third with test leads from ground to INH-. It appears capacitance to ground significantly shifts the output. More investigation is needed on why this occurs. The load regulation is pretty poor. The G808 card was significantly modified in the later rev K schematic I have from the board in my machine. The poor regulation may be why. The front panel draws from .15A to 1.6 A from the -15 supply depending on how many bulbs are lit. The memory + supply is 42.1 stopped, 41.2 running. I did a line regulation test, the results are shown with the scope photo in the pictures below. I didn't run a load regulation test though probably should have. Several of the capacitors were soldered in with bleed resistors across the terminals. For these I reformed them installed in the power supply with the current limit 5-10 mA above the expected current through the bleed resistor. The power supply control cards were removed and from the schematics applying power to the capacitors shouldn't cause problems. Since I don't know the exact value of the bleed resistor and the value changed as they heated up I can't measure the leakage current accurately. One of the 75 volt capacitors seemed to be leakier though it got better after a few hours. They all seem acceptable to use. Due to the corrosion on the screws I wanted to check the socketed relay. After some careful prying I was able to remove it and a bunch of corrosion bits fell out. 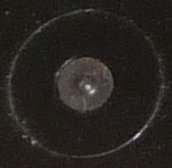 Further inspection showed one of the contacts was also damaged. I purchased a new relay. I was trying to get a period relay and found a new old stock one in an old looking box. I overshot since the "new" relay was made in 1962. I cleaned the socket with contact cleaner, alcohol, and a small plastic tube brush. I also used some Caig DeoxIT/PreservIT before installing the new relay. Since the relay pins were corroded, I pulled the two chassis mounted transistors which were socketed. They were gold plated and didn't have noticeable corrosion on the pins so I reinstalled them with new heat sink compound. During later testing I found one of the transistors was bad and replaced it with a 1981 date code of the same DEC labeled transistor. I also cleaned the rusted chrome-plated hardware using Kano Exrust. Don't use it on parts that have any gold-colored cadmium plating. The rust had caused a noticeable amount of the chrome plating to flake off on some of the parts. They don't look too bad with just the cleaning. I'll see how long it takes them to start rusting again. Most of the screws are stainless steel so didn't rust but the nuts are chrome plated. I then cleaned everything and put it back together. One of the capacitor wires broke during the process so that was re-soldered, and a quick disconnect needed replacing. I loaded the supply with resistors and used pots to simulate the thermistors in the memory stack. The manual gave the rated currents for the supply except the -15 supply is listed as 15 mA. It could be 15A but I haven't found a correct value in a manual. I targeted about half load for testing. I then applied power. I monitored the input line current and output voltages. Using a scope I noticed that the output ripple was not symmetric on the positive and negative cycle of the AC line. I tracked that down to mismatched taps being used for the memory supply. The transformer has 40, 42, and 45V taps available for the memory power supply. The supply is center tapped with 2 diodes making a full wave rectifier. One of the diodes was connected to the 40V tap and the other to the 45V tap. This caused all the current to be pulled from the higher voltage tap. When I connected both diodes to the 40V tap the ripple waveform became symmetric. There was no evidence that the wiring was changed any time recently so either it was made wrong or somebody moved only one wire. Looking at another PDP-8 it looks like the wire from the transformer to the terminal block were incorrectly connected. I have moved the wires to match the other computer. When I adjusted the pot that was simulating the stack thermistor the memory read/write output voltage didn't change. I found the main pass transistor was shorted. When I replaced it and an open resistor on a G808 power supply control card the output worked properly. The next fault I fixed is the chattering of the relay with the bad contact discussed above when the supply turns on or off. The chattering may be why the contact was damaged. The chatter is due to a design error in the G809 rev B design. The schematic in the manual has a later version with the problem fixed. Due to the difficulty modifying the board to the later revision I made a different modification to fix the problem. I also found a wiring difference in the power supply which I though may have been an error but was a intentional change. Another fault I fixed is the meter on the output of the supply read about 15% high. I assume that the meter read correctly when the machine was new. Analog meters measure current so have a resistor in series internal to the meter to set the full scale voltage. The resistor value likely has decreased with age. I hoped to open the meter and replace the resistor but the case is closed with a crimped metal band which can't be safely removed. Instead I added another resistor in series. The last fault (as of this writing) is the neon indicator on the back of the power supply doesn't light reliably. The voltage they turn on with increases with usage so they tend to flicker or not come on all the time as they age. I didn't find a source for the Industrial Devices Inc Omni-vision 1020C55 neon indicator so it will stay as it is.